Got this from my friends blog-hope you will play! Exciting stuff for parents-especially parents who just had a new baby, who just sentenced themselves to at least 2 more years of diaper purchases and changes! Ever since we have been trying to get Topher to repeat this miraculous event with no luck. He'll sit on it all day, read books-whatever-but with no "prize in the pot", if you know what I mean. We have bribed with a big bag of chocolate with his name on it-taken him to the store and let him pick out a new train engine for when he doesn't wear diapers, showed him the wide array of big boy underwear he will get to pick from etc...but still nothing! He is all excited about the concept of it all-but with no luck. 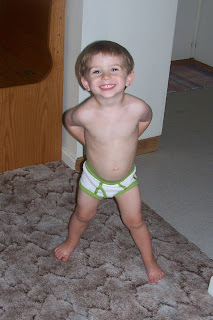 Today we bought him some Diego underpants, hoping to just get it done this week and he has been proudly sporting them all day. Let's just say he spent most of the day on the potty, with like 10-15 minute breaks in between in which time he has managed to ummm 'mess up' each and every pair in that pack. 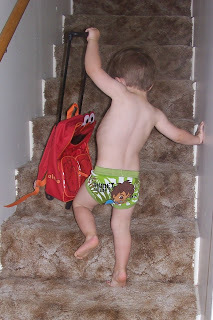 He is now back in a diaper while I wash all of his new underwear for another try tomorrow. Any tips? Chrystal-you're the expert on this right? Oh and everyone keep leaving comments on the chick flick post-I am getting a good list of movies I have forgotten about and ones I have never seen! Thanks everyone for the great ideas-I am going to need them now that Chad is working overnights! 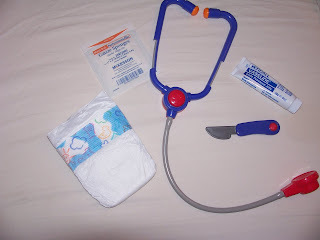 Porter had a little surgery today-can you guess what it was from the above pictured items? For details on what he thought about the whole ordeal check his blog here. Chad had to work-so I had to go there by myself-"You're killing me smalls!" I hated it, but it's over now-except for the next 5-7 days of healing! I love them-I know you love them... so what are your favorites? I have so many-a lot of new ones and a lot of old ones...like this one, that I watched tonight for the millionth time. 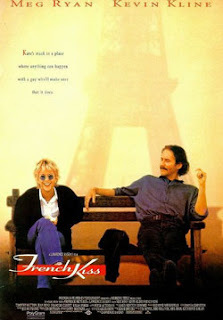 This was one of my faves as a teenager, I have always been a HUGE Meg Ryan fan-I wanted to look and dress and have my hair done just like her. This movie never gets old to me and I have it completely memorized. I bet I have seen most chick flicks out there, but I was wondering what your favorites were-I'd like a good list-or maybe reminders of some good ones for these nights I'm up anyways with Porter-and with Chad working overnights. 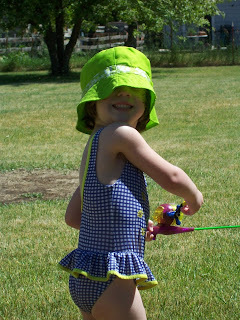 We went to Lake of the Woods for the 24th-or actually just for a fun Thursday afternoon. Pioneer Day just isn't the holiday that it is in Utah-which was kind of wierd thing for us when we moved out here-the wards usually just have a pioneer activity. Our ward had a bbq at a park today (Friday) which was a lot of fun-but no parade, no fireworks and yes-all the banks were open. Ha Ha! My mother in law works at Wells Fargo in Utah and when we talked to her she was surprised that my mom, who manages a mortgage company had to work on Pioneer Day. Too funny! 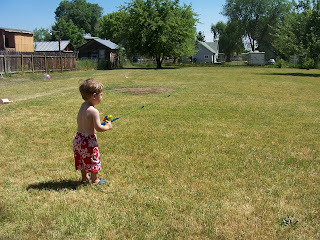 We had a great day at the lake though, even without all the hullabaloo the 24th usually brings! Bekah and her friends playing in the pebbles. Christopher filling up his bucket-if you look closely you can see the signature tongue out while thinking look. Ryeleigh spent most of the time in this boat with a friend or two. Zach was out on this log with this cute little girl (who has a major crush on him) the whole day, standing on it, running on it, jumping off of it-too much fun! It is about a half hour out of town and is a beautiful lake. Not only pretty, with a nice place to sit on the pebble beach-but the water is actually pretty warm so everyone was out playing in it, with the exception of Porter and I. I kept Porter under a blanket to shade him because it was so sunny and the rest of the kids played hard. He had to wear the sunglasses to get a picture, because he squirmed and cried when the sun got in his eyes. Wondering minds want to know-does Porter look at all like Christopher and Bekah? Well since Bekah was born before my insane digital picture taking days-I don't have pictures at easy access of her at this age-they are all in scrapbooks-so I would have to scan some pages in-and I am to lazy to do that right now! I do have pics of Topher by the grundle though! 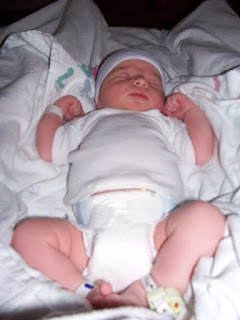 This is Topher in the hospital-after he was born. 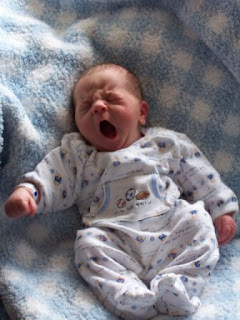 This is Porter in the hospital-after he was born. This is Topher in this outfit on this blanket. This is Porter in this outfit on this blanket. 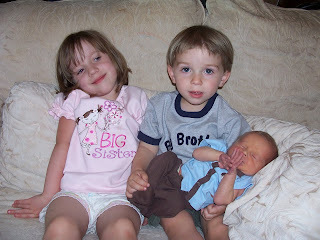 I think the obvious difference is size-Christopher weighed over 9 pounds in these pictures while Porter weighs under 6. Christopher had dark hair and Porter has light hair. It's hard to say-but I see Topher and Bekah in him a lot throughout the day, but that's me. Well for those of you keeping tabs on Porter on his blog know that he is not gaining weight very quickly-but is gaining so woohoo! Well he's not the only one with a low weight! I went in for my 2 week check up today and I weighed less today than I did when I got pregnant! It was a happy little treat for me! 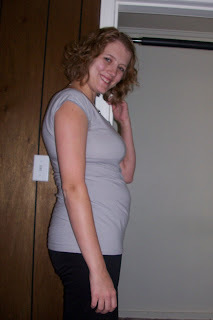 I still have a little prego belly to tone, but that is the easy part, since I don't have too much weight left to lose before I am at my ideal weight! The plan is to fatten the baby up and skinny the mom down. A lot of you have asked how I am feeling, and the answer-besides being really sleepy-is GREAT! The delivery although stressful to have a baby that early, was so easy and the healing is going fantastic. I haven't needed pain pills at all. The pregnancy was pretty great except for that last month (which might have had something to do with the 1500 mile road trip we took-shhhh!). 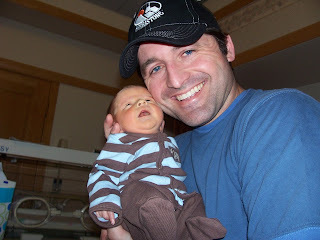 I am really doing great and feeling great-and with a new baby as cute as Porter, how can I not be all smiles? One is sleeping with a book on her face. 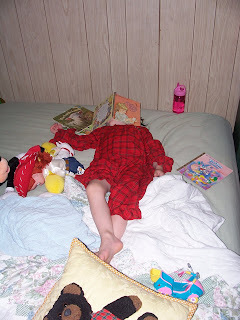 How does one get a book on their face while going to bed? One wants to eat again, even though I just fed him an hour ago-where did this appetite suddenly come from buddy? This one is wide awake with no future plans of going to sleep-"Mom, can I have some cereal?" Sure dude. 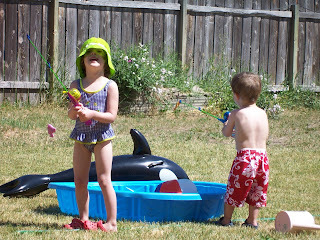 The kids went fishing in our backyard today. 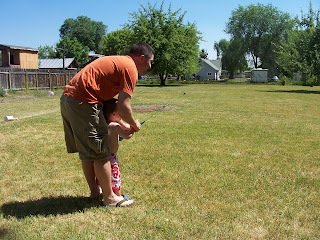 They got out their poles they got from Easter and dad taught them how to cast and reel. 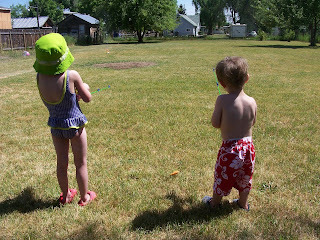 They had a lot of fun on the grass and then they moved it to the pool. 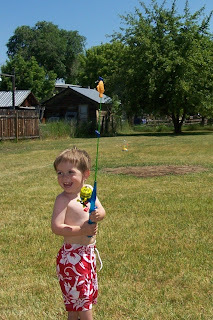 Topher got so excited everytime he got his little fish sinker to the top of his pole and Bekah's little bum in this swimsuit cracks me up-LOVE IT! I had to throw a pic of Porter in there too, I am loving having this sweet little boy home with me-I have withdrawals if I'm not holding him-he is so great and little and cuddly, newborns are so fun I think. 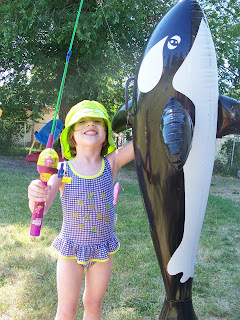 Check out Bekah's big catch of the day, it was hysterical watching her pull it across the lawn! Look Mom-I'm on the Web! 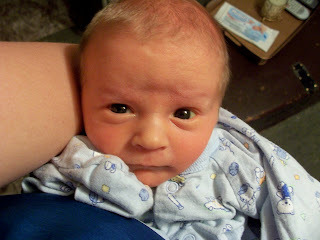 For those of you who would like to join the Porter fan club...the new baby blog is now Porter's own blog. 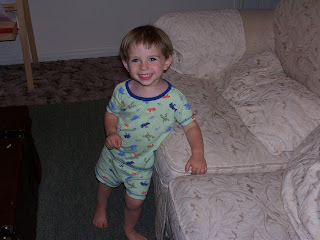 I am posting daily pics and updates on his blog-mostly for my mom who can't stand it that she is so far from this peanut-and for me, so when I do get around to scrapbooking-I will have the material! So click on his link if you would like to watch him grow! One of Tophers favorite games is to point out different features on people and on himself. This is one of our tricks to get him to look at us when we take his picture-we ask where our noses are and he'll look and point at us and say "right there!" Well today he wanted to show us where everyone else's nose was too. The result...some really cute and funny pics! Just some photos taken this morning before church in our backyard of the whole fam. Thanks mom for taking these! They turned out really fun! My mom left today to go back to work tomorrow, but before she left she took some pictures of Porter. Here are some of my faves. 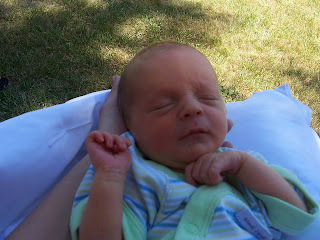 We finally got to come home from the hospital on Friday, July 11. It was a very long week, it was so nice to come home and be with Chad and the kids again. 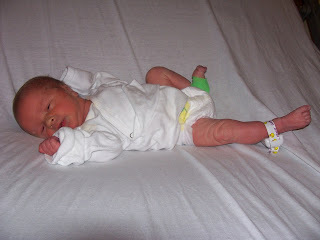 Here I am finally able to get him dressed in something other than the hospital undershirts! 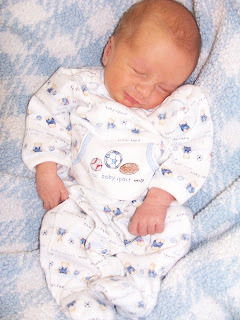 He is such an eenie little peanut-it's a lot different getting this little light weight dressed compared to my other giant babies that's for sure! 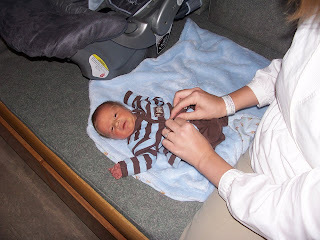 Then below a very happy mommy (looking hagard and exhausted-because I am) and Porter leaving the hospital room. Happy Daddy getting to take his little baby home. 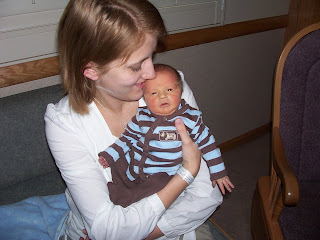 I know it was hard on him too, not being able to stay at the hospital with us, but we just didn't have anyone we could leave the kids with overnight. 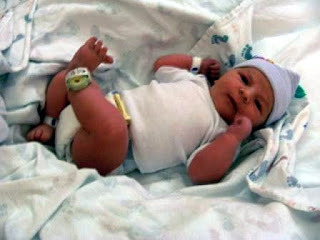 We were so unprepared for him to come this early! So I know Chad was as excited as I was for us to be coming home. The kids were really excited to have us come home too. Topher was really excited to have his mommy home-I think he thought I moved to the hospital-he was super excited the next day to see that I was still home. My friend Carol that lives by my mom sent these adorable big bro and big sis shirts to Bekah and Topher-they are SO cute! 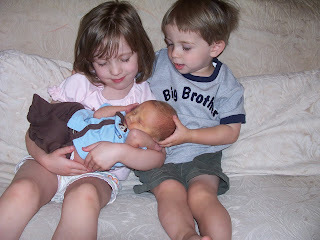 Both kids love having baby Porter home too, they always want to hold him and Topher always wants to "help". I have to have Porter vision 24-7, so the poor little guy doesn't get too loved by his big brother. 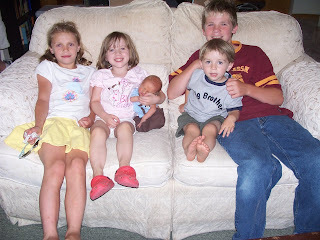 Here is a picture of the whole brood-look how eenie Porter is! I can't believe how small he is! We just found out today that Zach and Ryeleigh are going to be staying an extra week-so they are going home on August 3. So our house is loud, insane and crazy full-but I would still rather be here with all this, than be in the hospital by ourselves! I am still feeling a little stressed about having him come early because I don't have a bedroom for him right now-so all of his stuff is in our room and makes me feel a little (okay a lot) crazy. I am just so glad that he is here and that he is okay, that it makes the craziness (mostly) bearable. Thanks for everyone's comments and well wishes on Chad's post-we love you all!